A screenshot from the winning e-artefact "The Honey"
(Date: 14/8/2015) First of all, let us say how delighted the AMORES project team is that this competition has been such a resounding success! The aim of AMORES international competition has been to encourage students all over Europe to discover works of literature and use contemporary technologies to help them understand and interpret what they have read, and we are very pleased that so many of you took the time to make and enter an e-artefact! There were over sixty entries altogether, and around thirty of these complied with the competitor guidelines. Each e-artefact was assessed by two jury members against the predefined criteria. Our five judges had a very difficult job of deciding which of these creative e-artefacts stood out as the best. Second class of the JUNIOR SCHOOL OF KEFALOS, KOS ISLAND, GREECE (Athanasiadis Nikolaos, Athanasiadi Stamatia, Diakantonis Kiriakos, Diakogianni Christina, Kritikos Emmanouil, Billis Xaralampos, Niarou Evagelia, Oikonomou Emmanouil, Papasevastou Ioanna, Sahlis Ioannis-Efraim, Strati Anthoula, Tsataros Ioannis-Apostolos, Tsolakidi Antonia) with the entry THE HONEY. This e-artefact based on a folk tale from the island of Kassos, Dodecanese, Greece, has been created under supervision of teacher-mentor Psarrianou Iakovi-Eirini. The winner is the recipient of a trip to Dubrovnik, Croatia, for the award ceremony and the final event of the AMORES project. The prize is awarded to one student and one teacher – mentor. This Press Release is issued by the training consultancy company NSF CYBERALL ACCESS that is the dissemination leader in this project. Date (19/5/2015) - All interested students are invited to enter their e-artefacts in this international competition, organised as part of AMORES project. The e-artefacts should be based on a work of national children’s literature. The author of the best e-artefact will win a trip to the final event of the competition, to be held at the Valamar Lacroma Hotel in Dubrovnik, Croatia, on 18 November 2015. Date (22/04/2015) — AMORES project – aimed at developing children’s love for literature – is taking part in World Book and Copyright Day and World Book Night celebrations this year. To mark the occasion, the five European schools taking part in the project will hold a joint videoconference on 23 April at noon to share their experiences in the project. AMORES project aims to improve european and national literacy reading in schools through the use of innovative technology and methodology. More than a fifth of children and young people (22%) rarely or never read in their own time and nearly a fifth (17%) would be embarrassed if their friends saw them reading. Many school students lack knowledge of national and European literature. Its first set of public products/deliverables can be accessed from our results section. Date (17/01/2015) — The AMORES project has recently completed its first year and has provided full access for free to its first set of public products All its due results are available for download upon registration. Some very interesting products are analysis of the state of the art in pedagogies and selection of technologies on teaching literacy through ICT as well as relevant learning materials for teachers. AMORES starts officially 1st December 2013 and ends 30th November 2015 and during this period it aims to improve students engagement in reading of national and European literature through a methodology based on ICT, interactivity and collaboration. Students from 5 different countries will exchange their e-artefacts on national literature on-line and at the final event. The teachers will meet with colleagues from partner schools and will develop an online community as a support for implementation of a new methodology. They will use their mother tongue and English as common working language. More than a fifth of children and young people (22%) rarely or never read in their own time and nearly a fifth (17%) would be embarrassed if their friends saw them reading. Many school students lack knowledge of national and European literature. 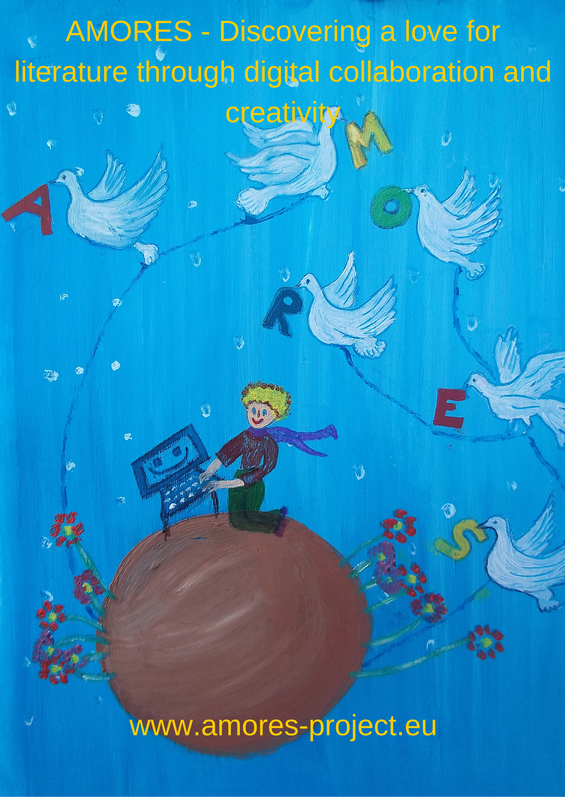 AMORES project aims to increasing reading of european and national literacy in schools through the use of technology and new pedagogy methods. Date (30/11/2014) — Based on the above, the AMORES project focuses on improving literature learning across Europe by improving students engagement with literature through a methodology based on interactive and collaborative use of ICT as well as on improving digital literacies of both students and teachers through the creation of e-artefacts, critical reflection on their production and their use in social participation.